The Spruce is a ranch-style home with an extensive main floor plan and interesting use of living space. 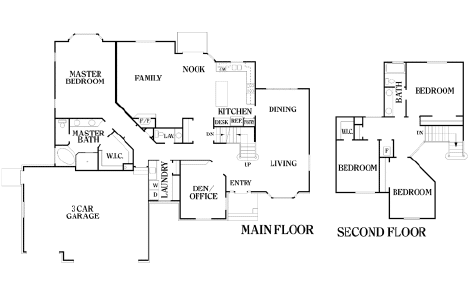 In total, the house plan occupies 5,700 square feet, with the finished interiors comprising 3,305 square feet. Three bedrooms and a bathroom are located on the second floor. The main floor sports the master’s bedroom, complete with a master bath and a walk-in closet. It is also host to an island kitchen with a family dining area and a nook, an integrated living and dining area, a laundry room, and a den that can be used as a home office. The garage can amply fit up to 3 cars. Constructing a home like the Spruce may seem intimidating and tiresome, but Perry Homes aims to streamline the process for Utah families. After 40 years in the home construction industry, we’ve earned a reputation among folks for our top-tier construction, fair pricing, great work ethic, and customer-oriented business model. Each client of ours partners with a design specialist to help them customize their home to their liking. Moreover, our customer service team is ready to assist with all follow-ups related to the post-construction phase. Call Perry Homes at 801-264-8800, or leave your details in the form on our Contact Us page. We’ll be in touch with you as soon as possible, and we’ll gear up to help you build your dream Utah home.